The Trump administration has strengthened U.S. relations with Riyadh, touting a $110 billion package of proposed weapons sales as a key economic achievement, but reports the Saudi government plotted the murder of journalist Jamal Khashoggi at its consulate in Turkey has added pressure. In a Wednesday night interview on Fox News, Trump said he would want to know what happened before committing to a response and expressed reluctance to halt arms sales to Riyadh, citing economic concerns. “Well, I think that would be hurting us. We have jobs. We have a lot of things happening in this country. We have a country that's doing probably better economically than it's ever done before,” Trump said. On Trump’s first trip abroad as president, he visited Saudi Arabia and announced the massive arms sales package. U.S. ties have long been anchored by energy interests, counterterror cooperation and more recently U.S.-Saudi military cooperation in the Yemen civil war. 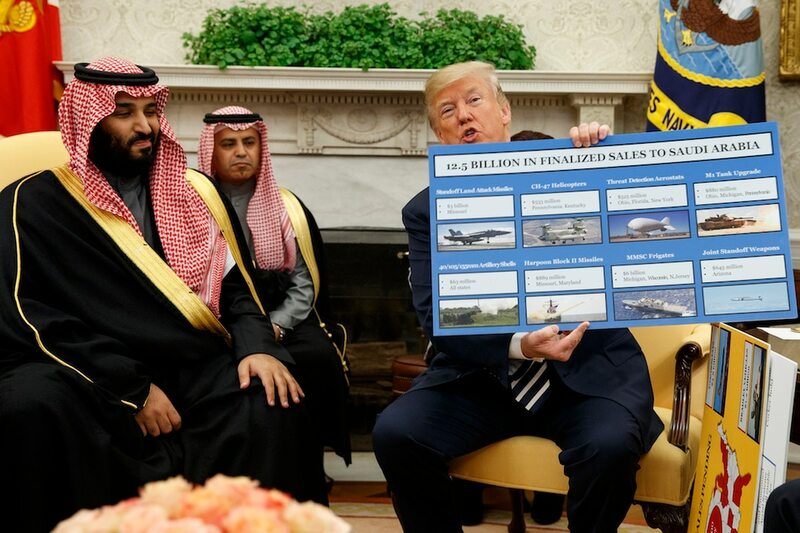 Since 2009, the executive branch has notified Congress of proposed foreign military sales to Saudi Arabia of major defense articles and services with a potential aggregate value of nearly $139 billion, according to a Congressional Research Service report. The U.S. and Saudi Arabia concluded arms sale agreements worth more than $65 billion, from fiscal 2009 through fiscal 2016. More than 20 Republicans and Democratic senators on Wednesday instructed Trump to order a probe into Khashoggi’s disappearance under legislation that authorizes imposition of sanctions for perpetrators of extrajudicial killings, torture or other gross human rights violations. Connecticut Democratic Sen. Chris Murphy on Thursday called for the administration to cease military support for the Saudi-led coalition in Yemen, citing reports that Khashoggi was killed at the Saudi consulate in Turkey. Murphy is part of a growing call in Congress to check U.S. support — which includes aerial refueling and arms sales — amid reports Saudi airstrikes have killed civilians. Earlier in the week, Sen. Rand Paul, another member of the committee, called for a halt on U.S. arms sales to Saudi Arabia until Khashoggi is found alive. Paul also cited Saudi Arabia’s intervention in neighboring Yemen’s civil war.